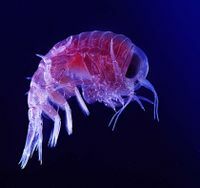 Plankton naturally sequester over 2 billion metric tons of CO2 every year to the deep ocean (DOE Center for Research on Ocean Carbon Sequestration (DOCS)). Phytoplankton today are nutrient-limited in large regions of the oceans. NASA has estimated that some oceanic regions have seen a drop in phytoplankton of 20-30% since 1980 (Behrenfeld et al, Nature, Dec 2006). This drop appears to be highly correlated to global warming of surface waters, which have the potential to stratify the ocean further and reduce the upwelling of nutrients to phytoplankton. Overcoming this nutrient deficit can restore productivity and improve phytoplankton carbon recycling, enabling phytoplankton to contribute to atmospheric carbon dioxide reduction. Behrenfeld, et al, 2006 have determined that the stably stratified ocean has experienced reduced overturning and primary productivity that is 10-30% lower than in the previous decade. Using wave-driven ocean pumps it is possible to help restore natural upwelling to levels corresponding to the previous decade and restore phytoplankton productivity to the stably stratified ocean. The dust settled onto the world oceans over a period of two years, providing micro-nutrients to the world oceans in the process.